In the heart of the district of Saint-Michel in Toulouse, the Apart-Hotel Lagrange City Toulouse is an establishment that offers the independence of a private apartment with all hotel services: reception, breakfast service, laundry, luggage storage, relaxation area with a gym, a petanque and badminton court... The 117 apartments are fully equipped with high quality services. In a quiet setting, this apart-hotel welcomes you for your business or leisure stay. The 117 apartments at the Apart-Hotel Lagrange City Toulouse range from T1 to T3 and offers upscale amenities: fully equipped kitchen (including 2 hotplates, extractor, sink, refrigerator, microwave, toaster, coffee maker, kettle and full set of dishes and cooking utensils, dishwasher (in T3), bathroom with bath and/or shower and toilet, flat screen HD TV (with international satellite channels), desk, air-conditioning, free WIFI access (1 connection per apartment, including smartphone; beyond, a surcharge applies) and a terrace. 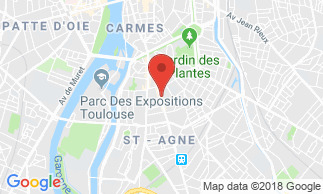 Near the Toulouse Stadium and the island of Ramier, the Apart-Hotel is located in the district of Saint-Michel in Toulouse. The heart of the city is easily reachable by metro but also on foot. Between Mediterranean and Atlantic, the wealth of Toulouse lies in its heritage and cultural life. From the Garonne to the Canal du Midi, the Basilica of St. Sernin to the Cité de l'Espace, the 'Pink City' seduces with its modernity, its diversity and ease of access. - public holidays 8 am to 12 noon and from 5 pm to 9 pm. Please inform the hotel in advance in case of arrival outside the opening hours. Hotel Lagrange Apart Hotel Toulouse St Michel The Appart-Hotel Guillaument is very well situated, clean and quiet. Beds are comfortable. Breakfast rate is a bit expensive and it would be more convenient if there was a shelf next to the shower in order to put things instead of use the floor. Hotel Lagrange Apart Hotel Toulouse St Michel We regretted the disposition of our room (B119) as it was impossible having an individual bedside lighting : are all rooms simiar ? All in all good !